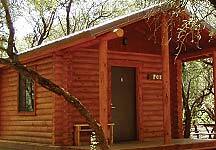 Comfortable camping cabins on the Verde River at Dead Horse Ranch State Park are tucked away from the other campgrounds for an ideal getaway for a weekend or a week. The cabins are variably furnished with a full-size bed, a bunk bed, table & chairs, dresser-drawer, ceiling fan with overhead light, and electricity. All cabins now have heat and AC!. Campers must supply their own linens or sleeping bags and pillows. Each cabin has a barbecue and picnic table outside, plus a small individual fire ring. Family-style shower facilities are only a short walk from all of the cabin and there is a shared ramada with barbecues and electricity that can be shared by cabin guests.